Welcome to my shop. My name is Mike Fulton and I work from an attached one and half car garage. I share a little bit of this space for the washer, drier, furnace and water heater. For the most part this shop is mine for woodworking. I have been producing YouTube videos from this shop for the last 4 years. From that moment I’ve been working on getting the shop to this point. I have nearly everything in the shop that want or need. I have a little bit a of space to spare for the future. This is my shop looking from the driveway. 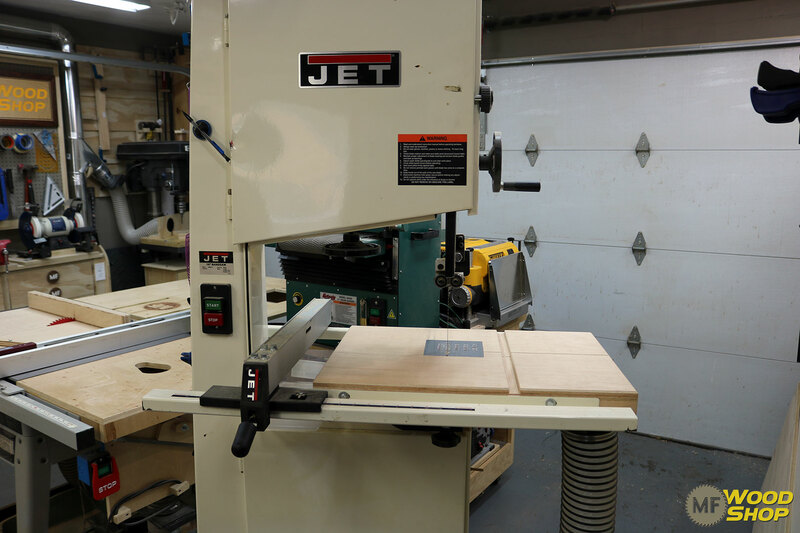 The table saw, band saw, planer, and drum sander occupies the center of the shop. 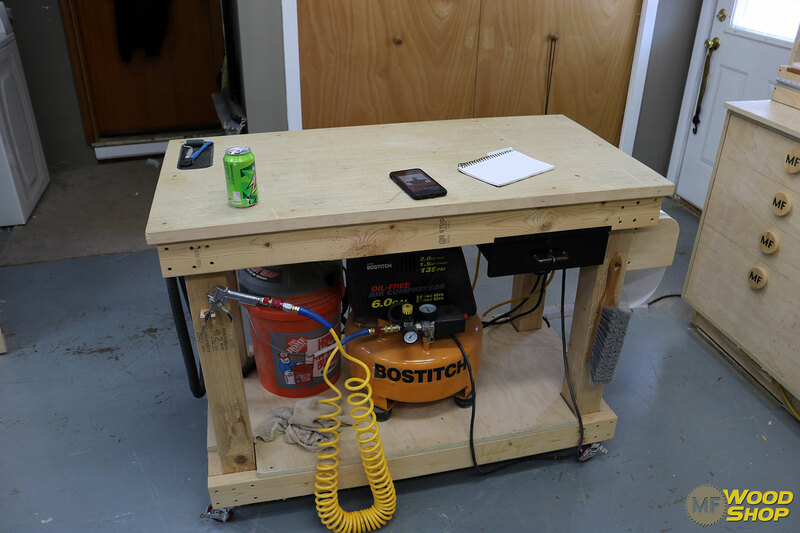 To the right is my recent workbench build and drill press. Along the back wall is the miter station wall. 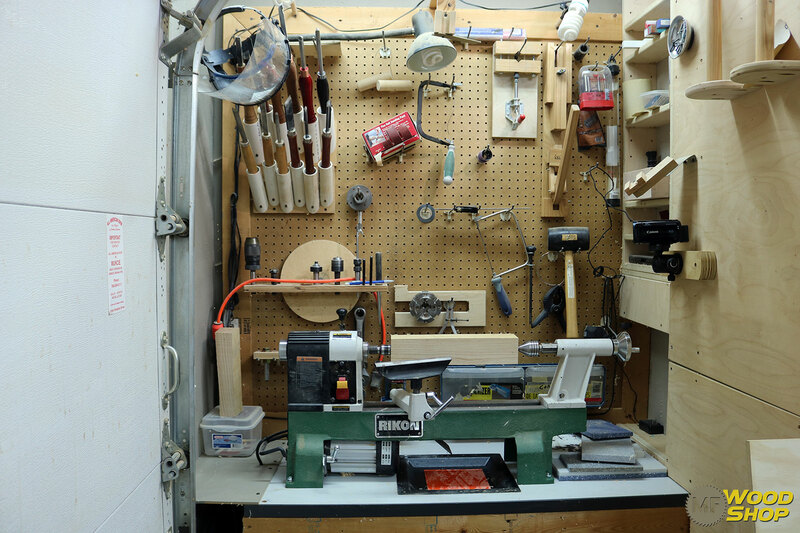 To the left is utility items, clamps and lathe. 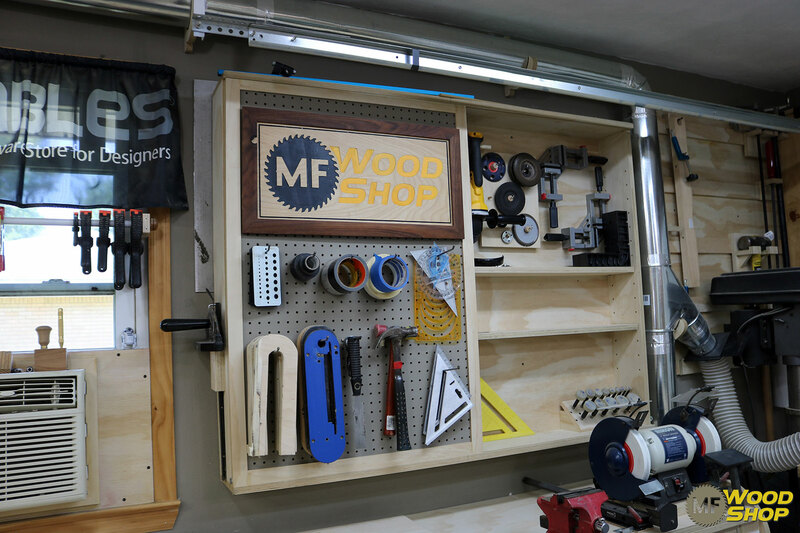 The right side of the shop supports my workbench and tool wall cabinet. 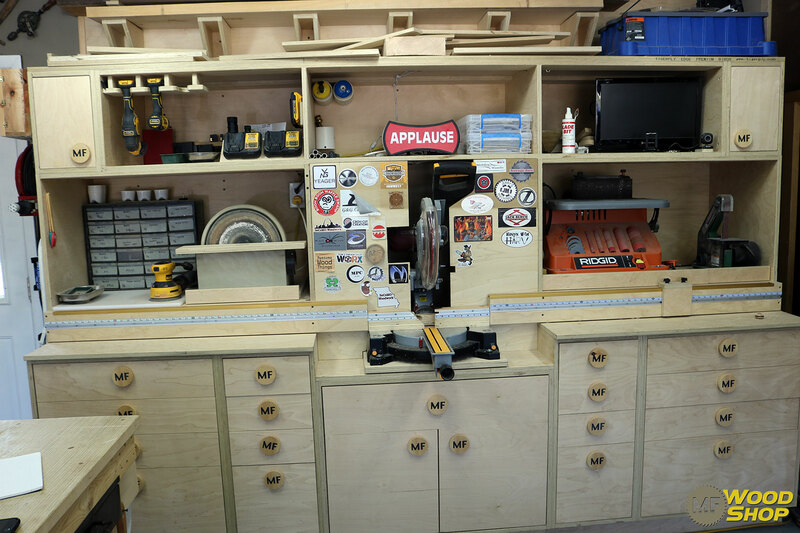 The workbench has a ton of storage with build in outlets. 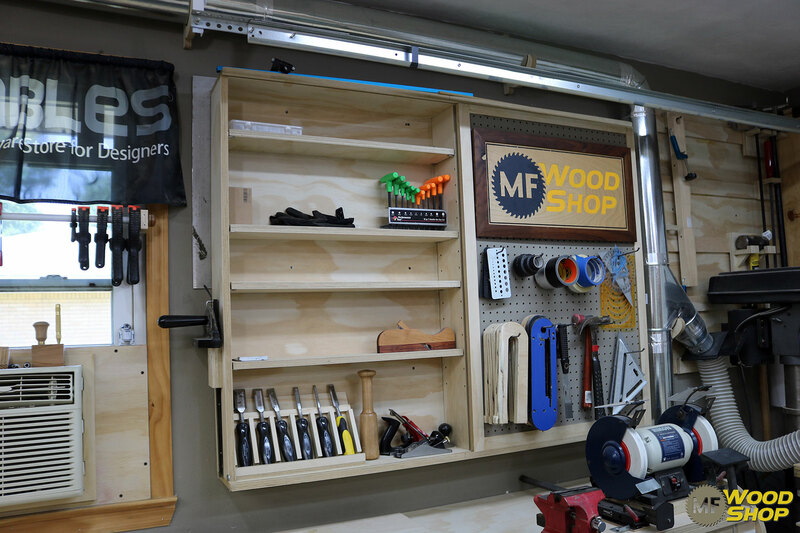 The tools wall cabinet has a half door that slide to one side or the other. 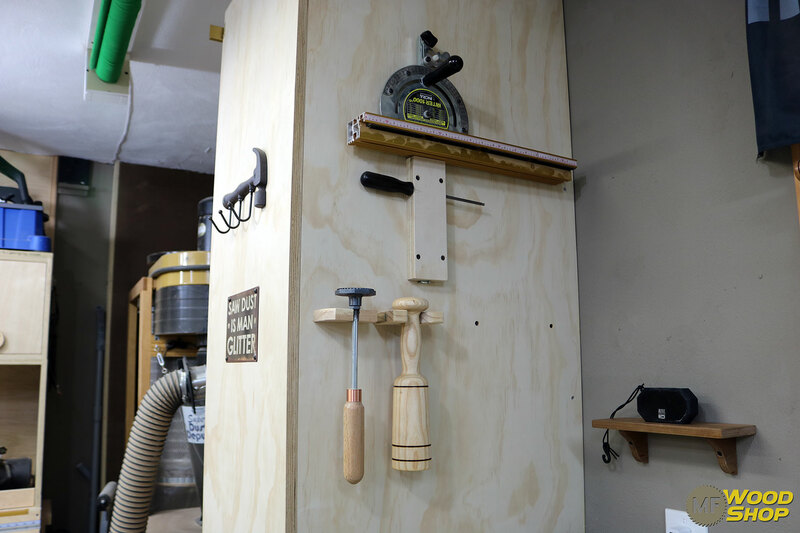 In 2017 I spent a lot of time building and setting up the miter station wall. 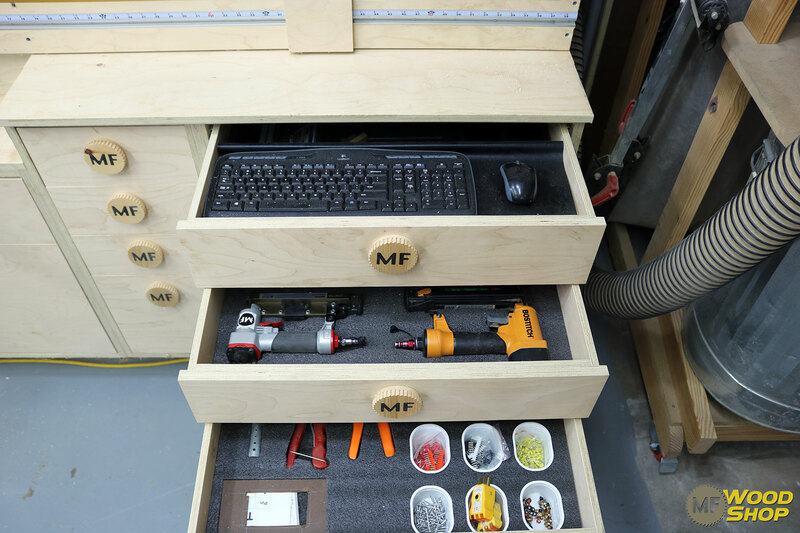 This, much like the work bench, has a ton of storage and has a few tools on slide out trays. 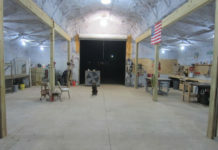 The left side of the shop is where utilities are. In 2016 I really started to divide the space. Built the wall to divide the washer and dryer. Then had room of that wall for clamp storage. From this view the lathe is to the left of the clamp wall tucked neatly in the corner. 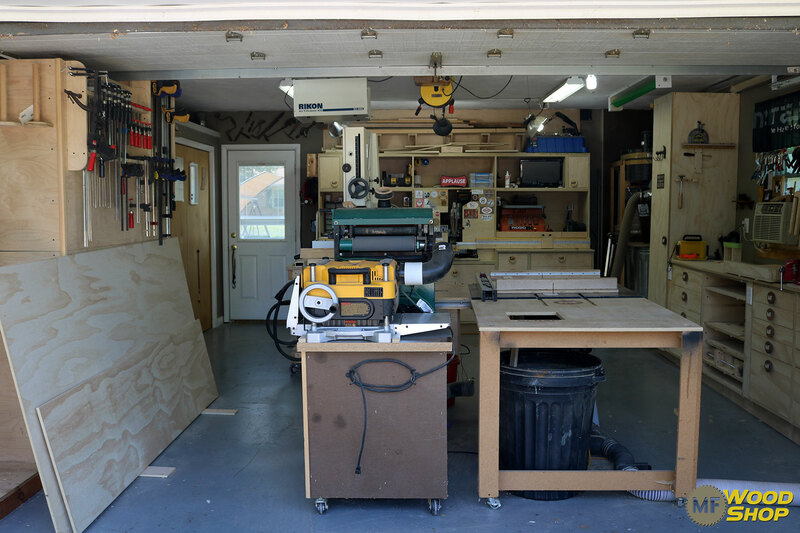 The heart of my shop is the table saw area. 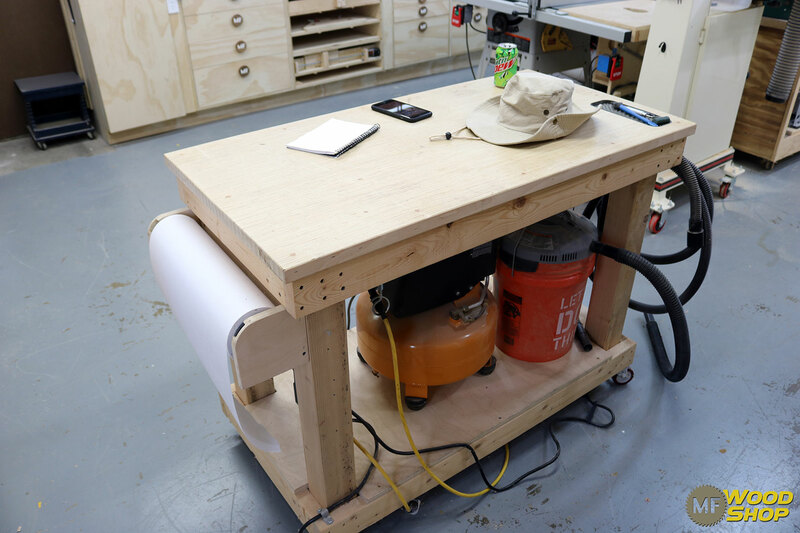 I’ve built an attached outfeed table along with Jay’s original router lift table. 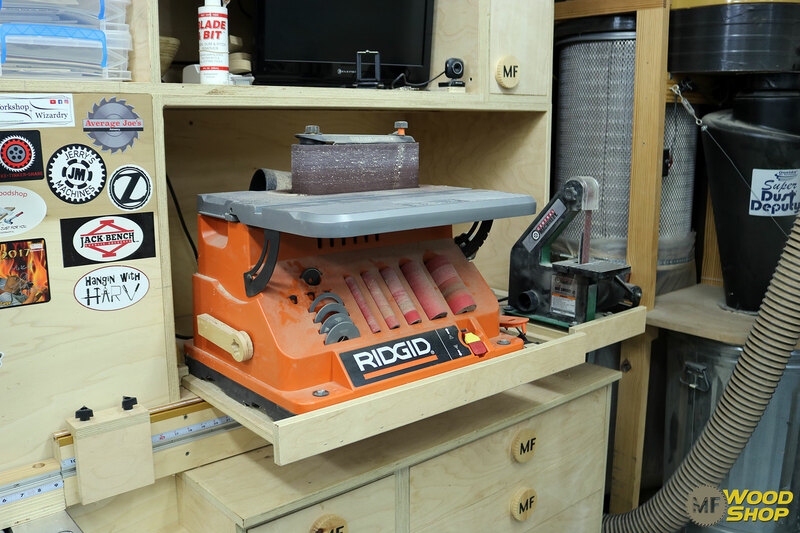 Back to the right side of the shop my drill press station has been an awesome addition. It fits nicely is this corner. 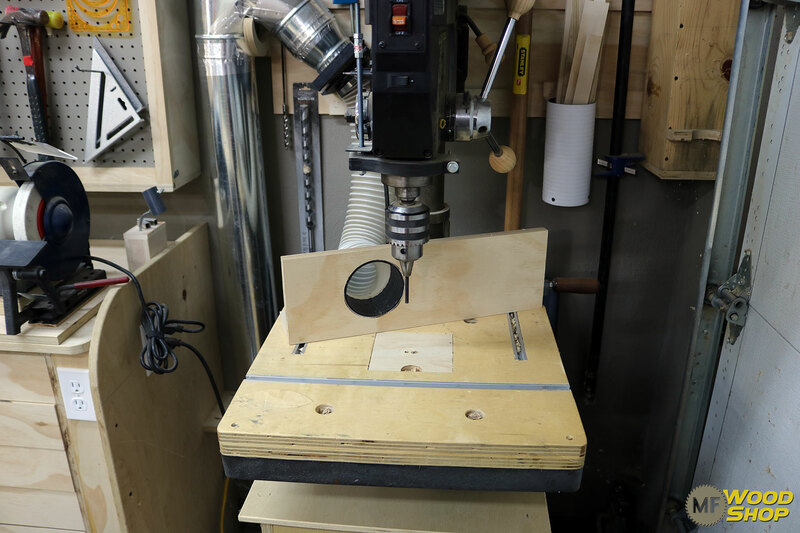 I built the cabinet under the drill press to store everything related to drilling. 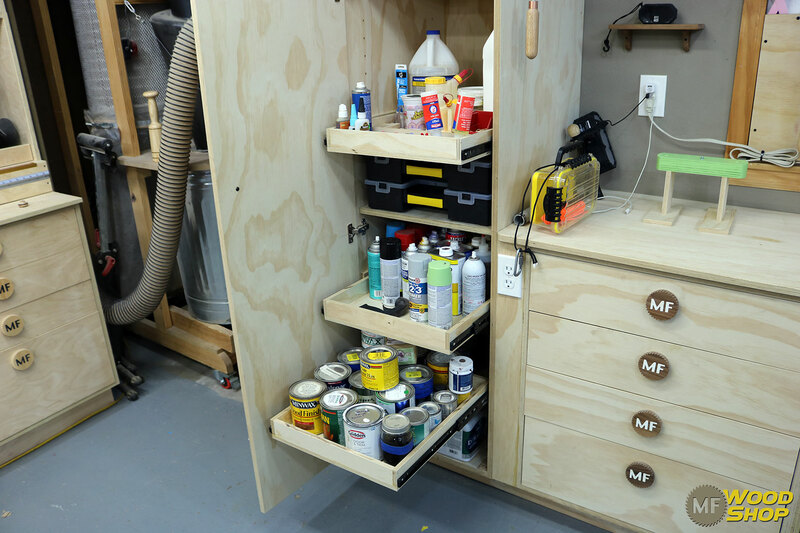 The top drawer of the drill press cabinet I made this one large enough for the K.I.S.S. drill bit system. The most used drill bits in shop. The drill press table has proven to be a very nice addition. It supports three T-tracks for many ways to hold work down or to add a fence. 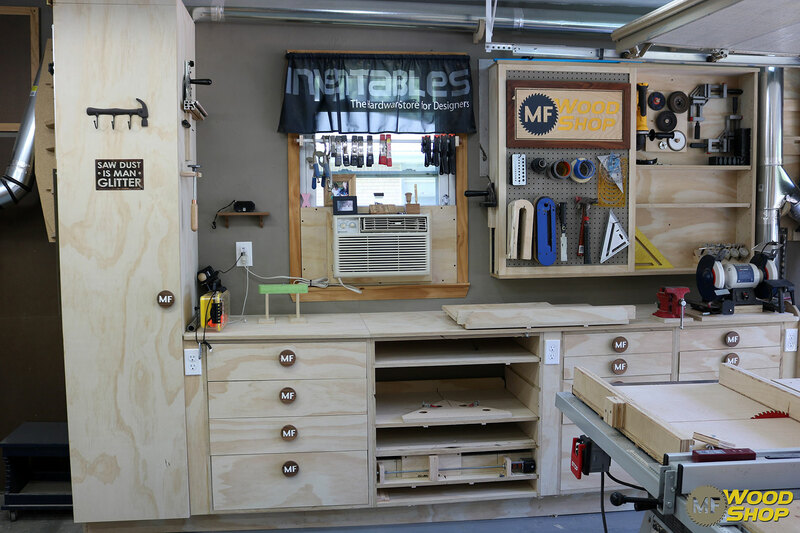 In 2018 I built the workbench with a 12’ top and four cabinets with a lot of drawer storage with a unique table saw sled storage cabinet. 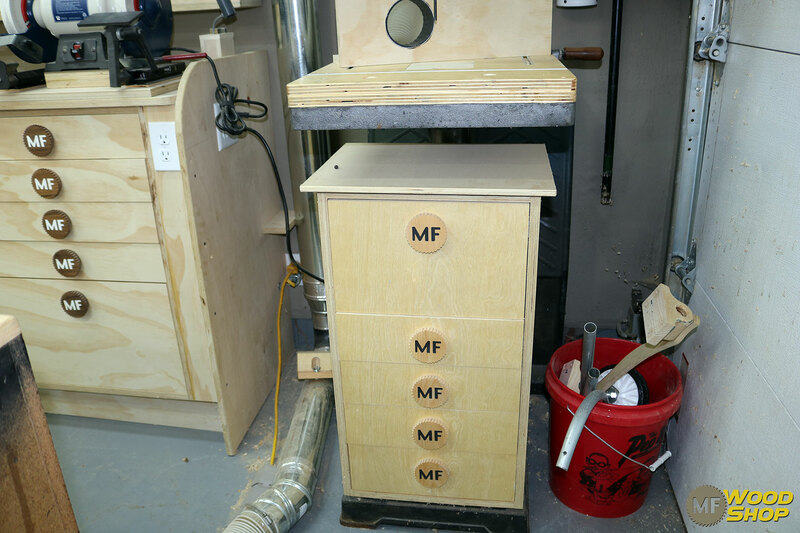 At the beginning of the workbench a tall locker cabinet. Inside the locker cabinet I store lots of paint, stains, glue and a few bins of hardware. On the outside of the locker cabinet I store my miter gauge and mallet. In the first cabinet was placed here because it’s the central location of the shop. It has all my hardware in the top drawer. The next drawer has every socket and rachet I own. The third drawer has bolts and nuts. The bottom drawer is mostly junk. The next cabinet is one that I love. 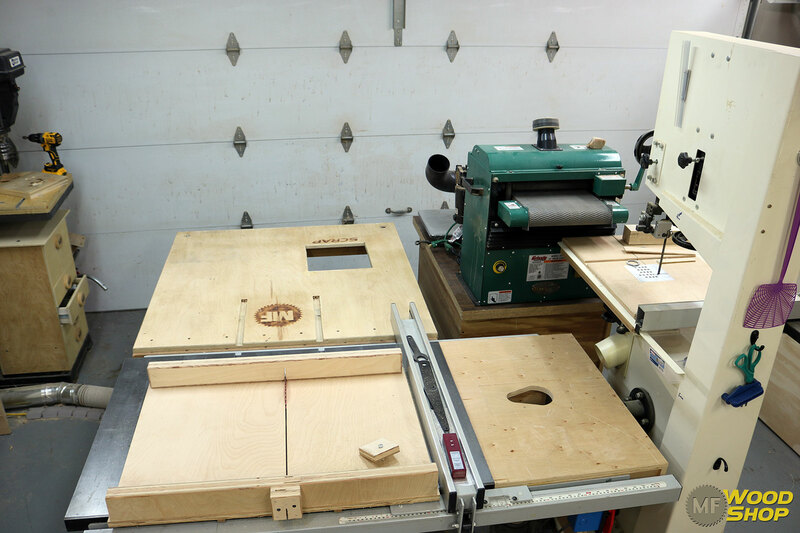 This custom cabinet has dados on each side with those dados I can slide my table saw sleds into them. 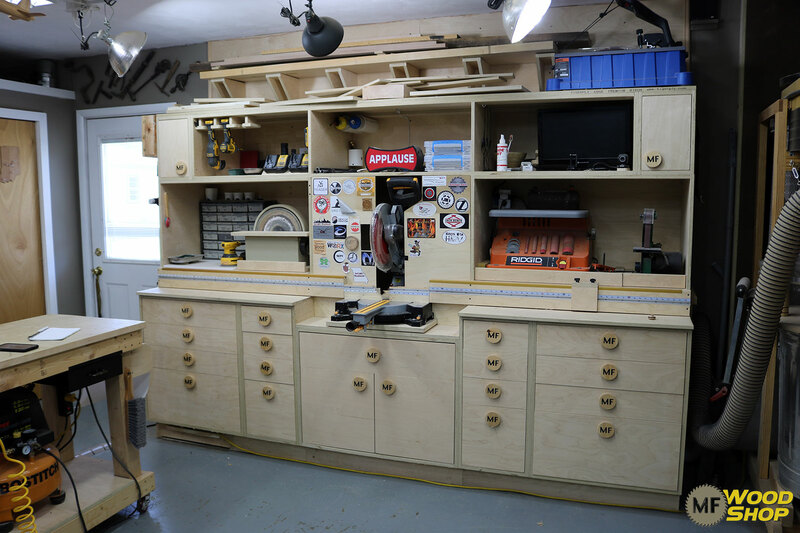 I can store up to five different table saw sleds within this cabinet. This set of drawers has nearly every day use items. Screwdrivers, wrenches…. 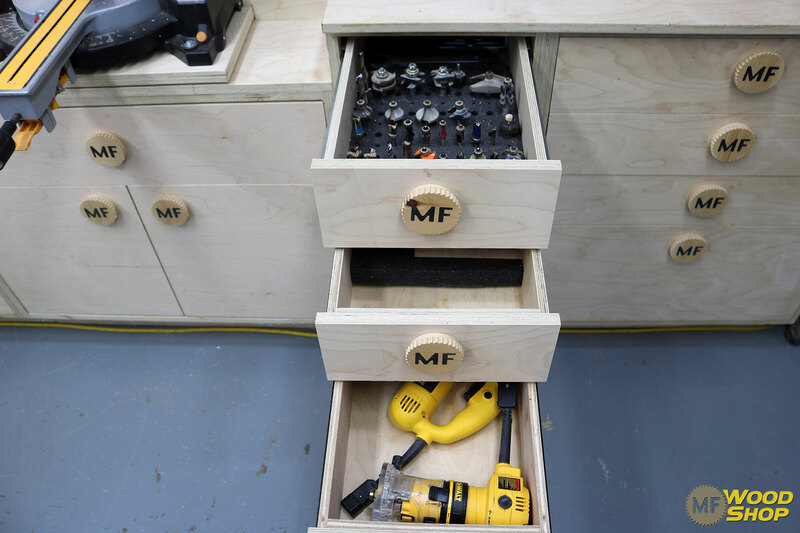 This set of drawers has pliers and electrical tools and meters. 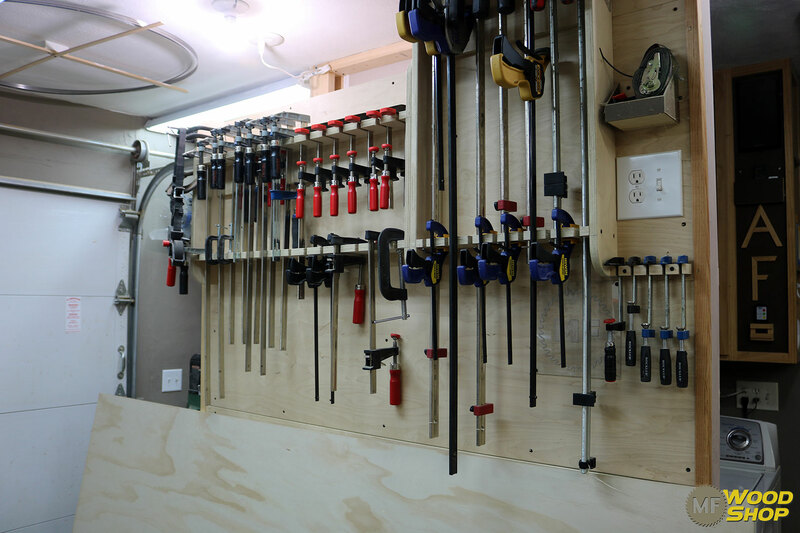 Tool wall cabinet has not proven yet to be a great addition. It features a sliding door that moves from one side or the other. This had to be a sliding door because the garage door rails will get in the way of doors that open. On the left side of the cabinet are shelves mostly because I haven’t found a good use for this cabinet yet. The right side of the cabinet has a few things hanging and my mostly use forstner bits. The drill press is right next to the cabinet. In 2017 I built the miter station wall it was the second wall I basically stated from scratch with. I took a lot of time to set up the drawers and the layout to fit my needs. I couldn’t be happier with the layout. It has three sanders that slide out on trays for easy use and storage. Lots of room at the very top to storage small cut offs or lumber. Built in dust collection that’s OK. With in the toe kick it has a dust sweep that work great. Set of five cabinet at the bottom that gives me lots of drawer storage. The drawers are extra-long at 28” with full extension slides. Even though I do use the miter saw more now. This was not the main motivator to build this. 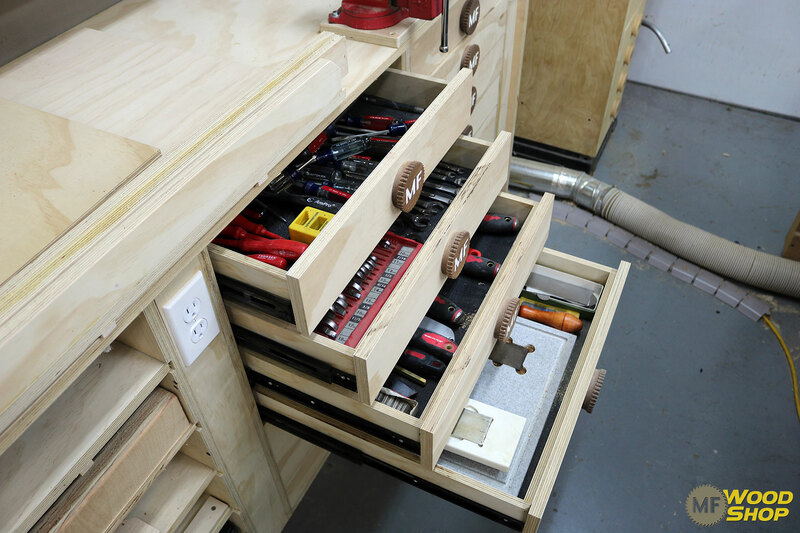 It was built for the drawer storage mostly. 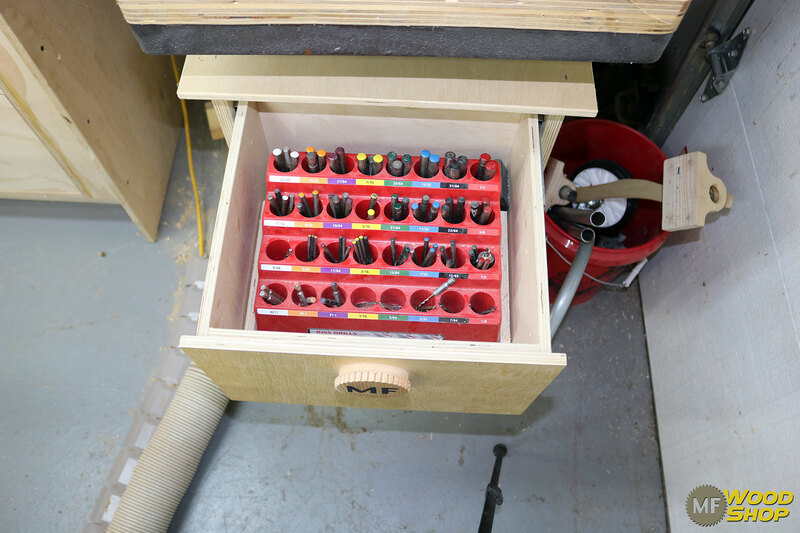 The next bank of drawers has router bits, corded tools and accessories…. These are game changers. These two sanders are my go to sanders. With them on these pull-out trays they can be easily attached to dust collection and used. On the left side is my home-made disc sander, also a game changer, with the power it has and the great dust collection it has its almost makes sanding fun. Include the easy storage by sliding it back into place, it just a perfect solution for me. 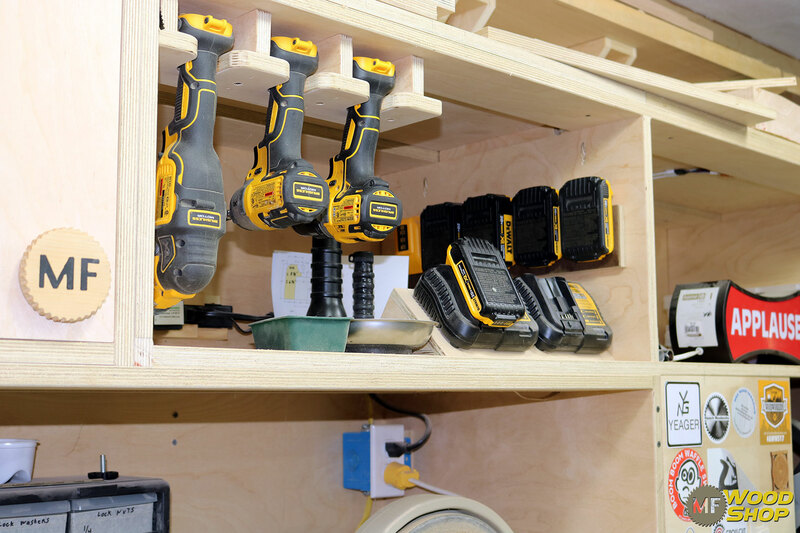 At the top section has a built-in charging station for my cordless tools. 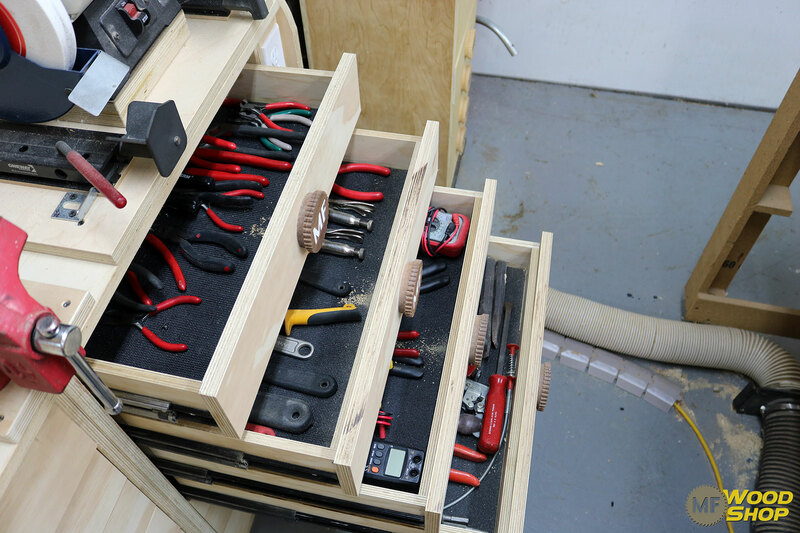 I’ll admit I don’t store my corded tools in the bracket much, but the battery storage works out great. I have plenty of batteries and they stay charged ready to go and rotated. My assembly table has been a great feature to the shop. It’s very strong 4×4 legs with 2×4 aprons, also includes a 1.25” end grain plywood top. This was a fun build, easy build, and very useful. Over time I’ve added a paper roll to the side and inlaid a glue brush tray. Also added a power strip for easy use of power tools. This added divider wall serves three functions. First it divides the washer and dryer from the work shop. Second it blocks the wood chip from the lathe from getting in the laundry area. 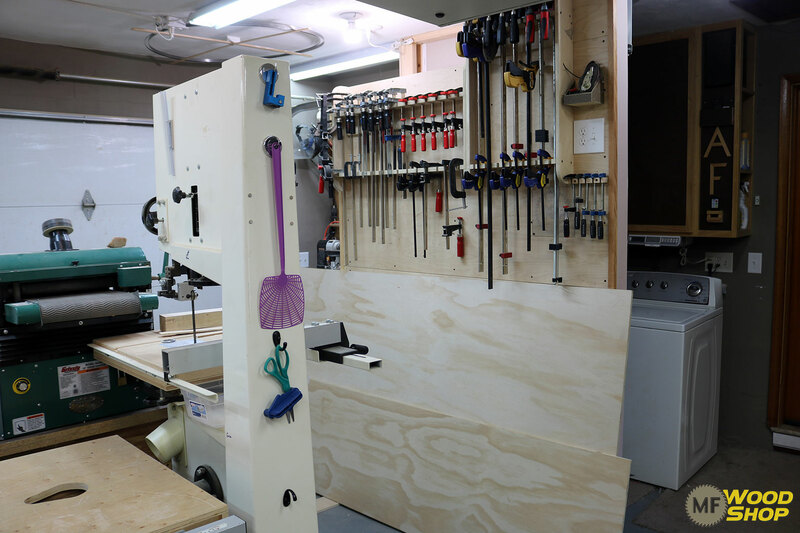 Third it gives me a home for all my clamps and give me a little bit of room for sheet goods below the clamps. The lathe area hasn’t changed a whole lot over the years. More tools added with use of the peg board I can easily change the lay out to fit new items. My band saw is a 16” Jet. I have changed out the table with a home-made dust collection table. It can be wheeled out for lager stock or most of time it stays right up against the table saw. 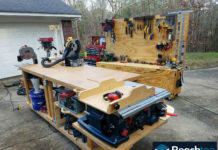 Router lift table built in 2016 using Jay’s plans and its worked perfectly every sense. I see no reason to change it out. 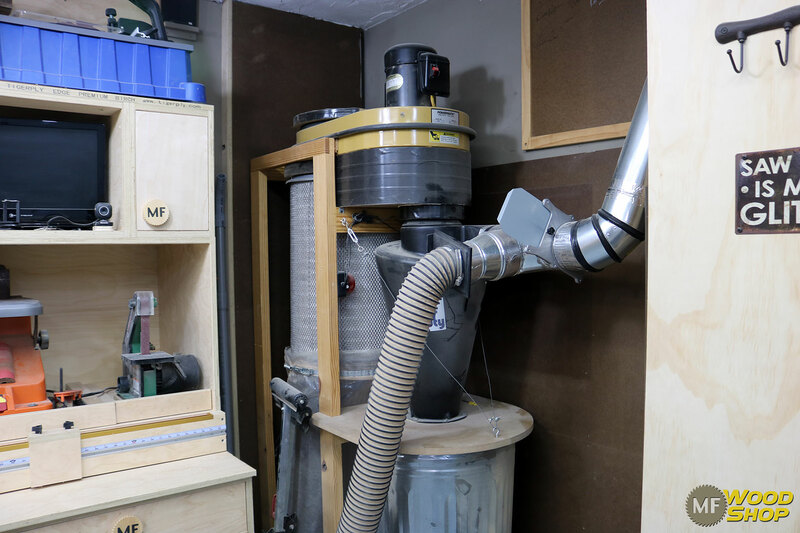 Dust collection unit is in the far-right back corner of the shop. Duct work runs to the miter station wall with a 4” hook up. Then it goes with 5” duct up over the locker cabinet down the right side of the shop and come down to the drill press. Then it goes across the floor to the table saw and bandsaw. Thank you for checking my shop. I have worked very hard at making it my own and I think I ‘ve reached the point where its easy and fun to get out in the shop and make what ever come to mind. Check out my YouTube channel and Subscribe with over 400 videos you should be able to find something that can help you. Also check out my other SM links. Thanks again. Thanks Jay for sharing my shop. It’s hard to believe the transformation over the last few years. I think we all have grow in our own ways and looking forward to the next step. 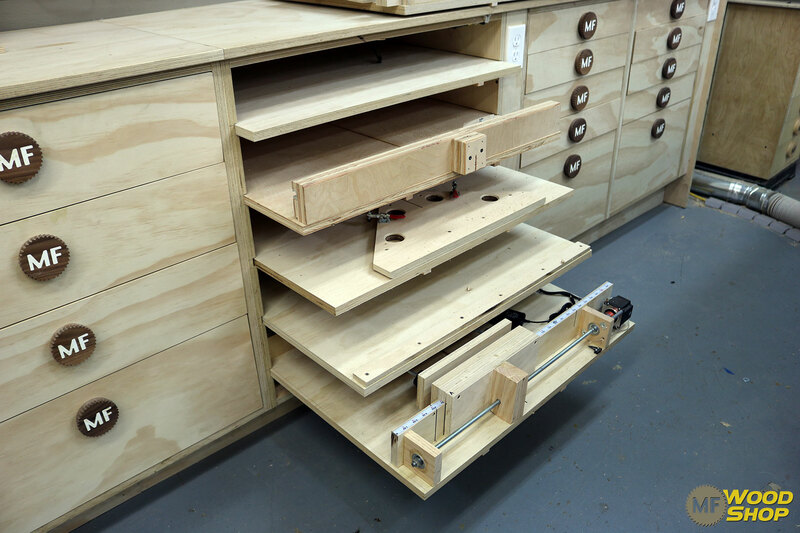 I really like the drawer setup for the table saw sleds. Genius! 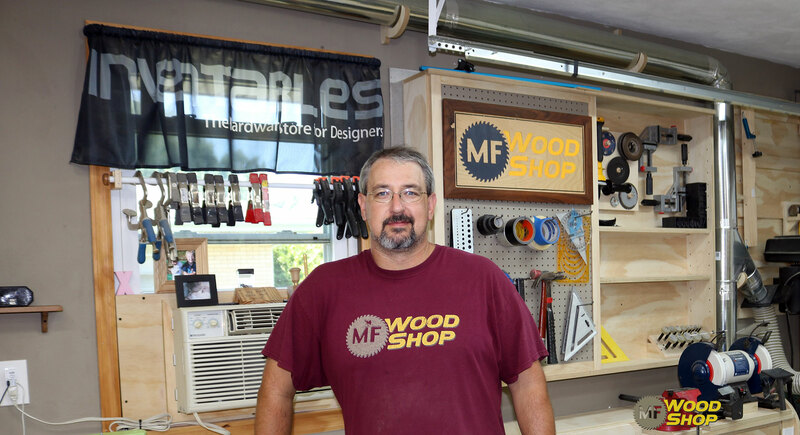 Cool glimpse into your shop, Mike! 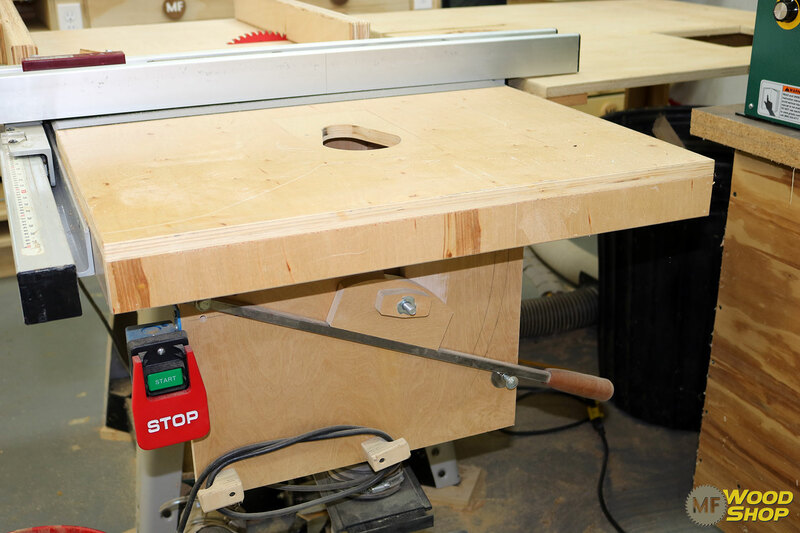 I especially liked the jig spot, where you could slide all of your table saw jigs into those dados. Nicely done! Flyswatter on the bandsaw. Midwest confirmed. 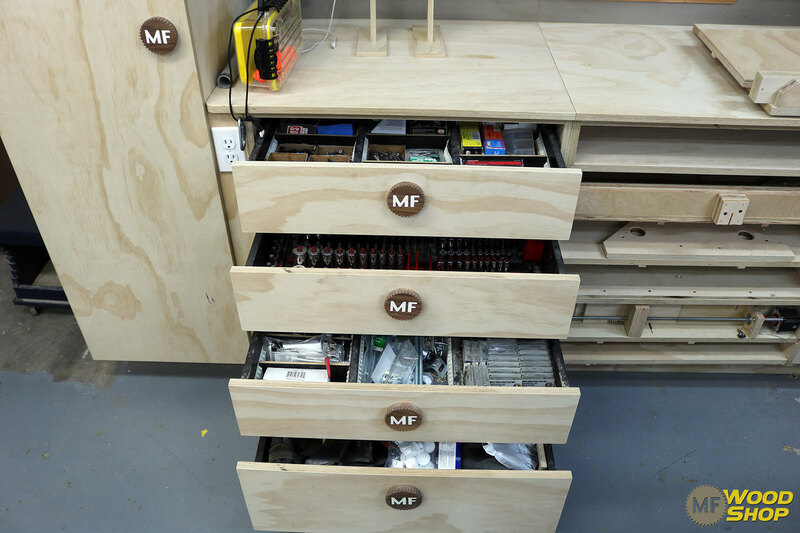 I dream of a day when I can get the shop this organized. 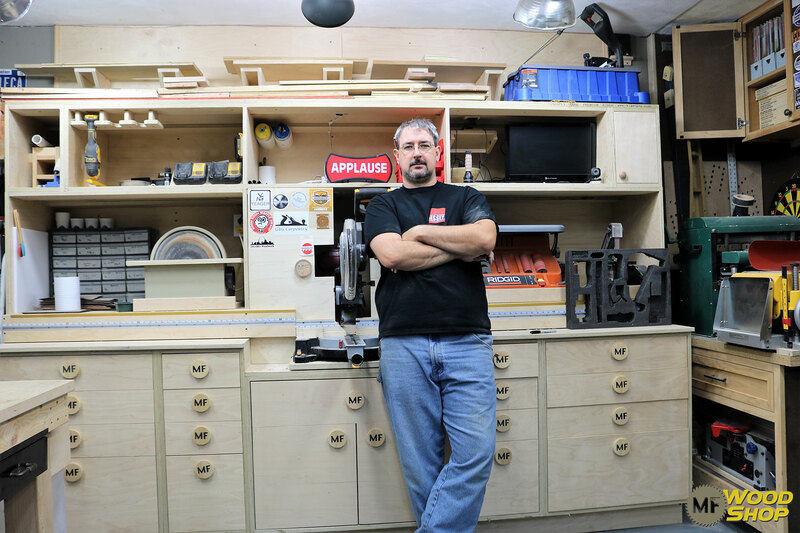 hand tool videos of building different projects would be a great addition to your great work. 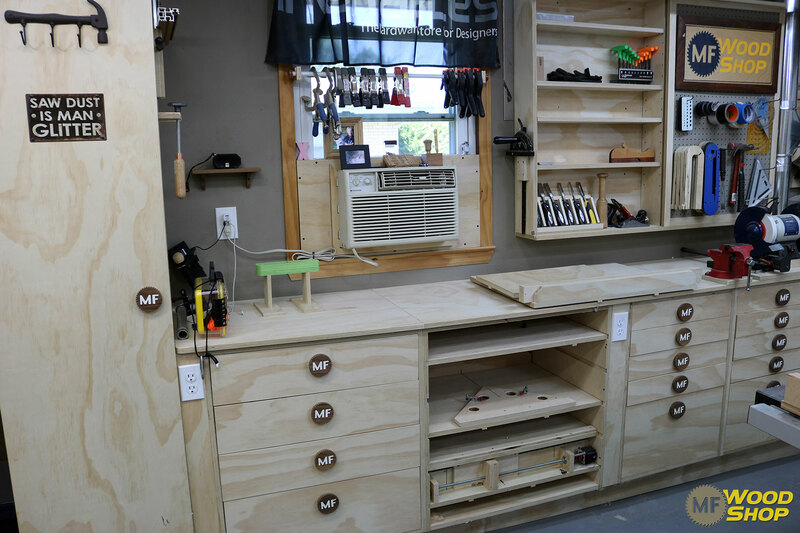 Great looking work shop Mike. Glad to see you are using some of Jays ideas in your shop, he is a good mentor to follow. Keep up the good work, you never know who you may inspire to do more. Very nice shop, Mike I would love to be this organized. I like your videos. I would like to see less cutting and drilling operations and hear more from you about your thought process, e.g., why you choose certain dimensions or arrangements. Hay Mike, that is so clean and functional looking it’s positively intimidating! Really interesting to see though, thanks for sharing. 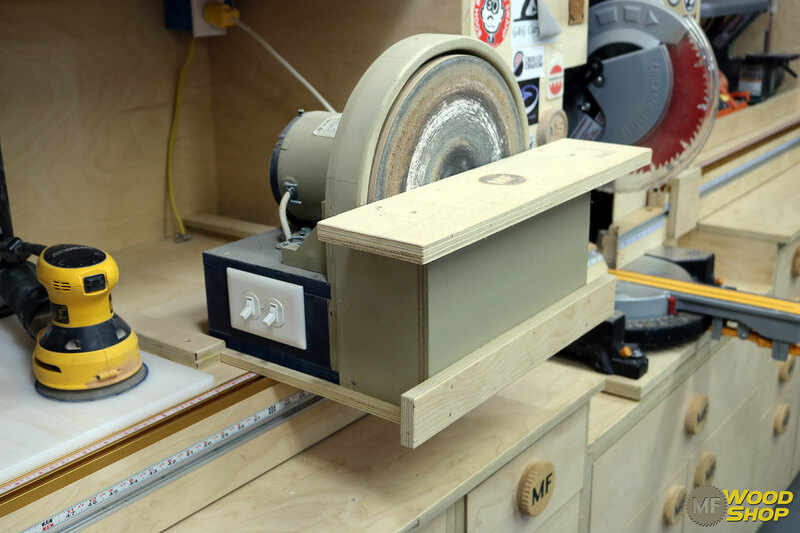 I very much enjoyed your torsion box bandsaw table/dust collection modification. Inspiring. Thank you for the tour! 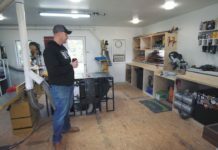 A shop of my own is my big wish list, but I’m not willing to relegate the Truck to parking outside. The sun here is brutal and will age your vehicle in a couple of years… Its a matter of choice I guess, but it’s good to see such a complete shop in the same floor space that I would have. Less the washer and dryer however. Mine have a room of their own. Congrats on your great work and thanks again for sharing. Hi – nice shop! Curious, what do you do if you need to open the garage door, so to bring in some amazing new big power tool ;-). Looks like the clamp wall is blocking the rails and cannot move?